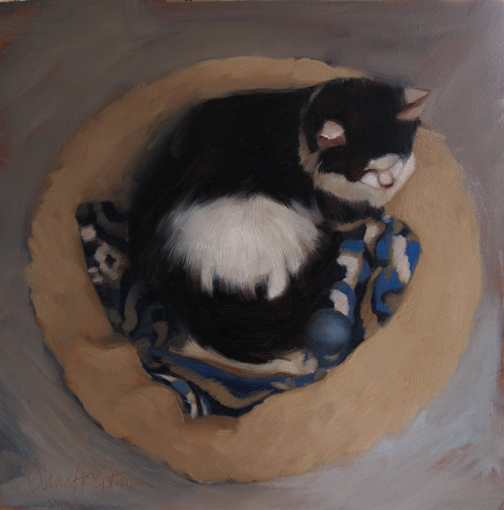 Diane Hoeptner: Dozing Waverly, Do you paint by value, color or shape? Dozing Waverly, Do you paint by value, color or shape? blasted light values correct, everything else would fall into place, or so I thought... Time passed, I started adding patterns (and cats) to the mix and dare I say (alert the press, heh) I think that shape may be more of my focus now... Fellow artists, I'm curious if you remember that letter (or identify with this concept?) If so, have you noticed your focus/approach change? Any comments, welcomed! Hi Diane. Your post has me thinking. I'm not familiar with Robert Genn or his letters, but I think maybe there are other approaches that can be stressed too, like maybe edges, lines, color, or textures. Anyway, I think for me, if I emphasize one approach it might be values. I think I have a decent handle on values and see them fairly well, but since I think I'm still developing as an artist I'm not sure if it's completely true or that I've "settled" on a single approach. I'm curious. Do you think that having a single approach is an important thing to develop and/or maintain? Thank you for commenting, Chris! Robert passed away a little while back. But you can still subscribe to his letters which are wonderfully complimented by additional letters from his daughter, Sarah. You should subscribe, you will enjoy them!! I agree about the number and variation of possible "approaches." I don't think a single approach is generally best, but speaking for myself, value was so big and such a mountain (continues to be) -- that I couldn't help but have it be my "main" approach for a lot of years. Hi Diane, For me, I have always felt that value (which I feel encompasses light and colors--which have values themselves) is the skeleton upon which the rest of the work is built. I like to think of the work in shades of grey (now we can do this to a composition easily by manipulation in the camera or Photoshop. When I began painting we had to have a value chart to figure out values. Most of my students never thought of it that way and with the modern technology it is easy to flip an image to sepia or black and white to see shades of gray. I still like to do monochromatic value under-paintings upon which I use color glazes. Even in more impasto painting I use glazes to control the push and pull of the work. All other things like shape and color make it interesting, but if you see it in shades of gray you can often tell why a work is blah or not working. It may all turn out to be the same shade of gray. Value helps move the eye around the painting, setup the focal point and where things are in space (even for abstract work.) So I have sort of lumped points 1 and 2 together for forming the underlying strength of the work. Shape provides interest and variation and preforms an addition to the composition's skeleton in the underlying abstraction of layout or more definition of objects and how they are arranged. I have never tired of value tied to color and light and find any genre exciting to work with. Some instructors have said my problem is not to have focus on one genre. I can find excitement and interest in most any direction I go. Thank you for the introduction to Robert Genn I am interested in more information. Love your work too. Thank you for commenting, Sherry! Yes, photoshop (and many tools) do make quick work of identifying values. I'm all about the color. Bold color, for me, sets the mood of my paintings and I find people commenting much more on my palette than subject, shape, or composition. Perhaps if I was better at sketching, that wouldn't be the case. But, hey, you gotta use what you've got, right? Presently, my style is mainly driven by texture. Since I am primarily a graphite artist, I definitely focus on value but I always keep in mind the negative space in my work. Now that I've recently started working with colored pencil I can tell my focus has turned to color as I am learning that medium but I think my values continue to be good since I have the background in graphite. But it is definitely a balancing act!!! Your drawings are amazing, Kathryn. I can't wait to see what you do with color pencils!!! I thought you combined all 3 elements in this dynamic painting! Keep up the great work! Hi, Lately, I've been caught up in values created by textures. Something I've never done, and working in black and white, am suddenly "seeing" artists who work in ink use textures as creating values. I like your post about how we have been "seeing" one thing and then as we grow, begin to look at and analyze the other basic elements we work with. So insightful. Thanks! So true. And there is no end. I notice good/interesting shapes in paintings more than I used to, it's great. Thank you for commenting, Glenda! Hi Diane, what an interesting topic. Not sure where composition fits in but I've got to have a good one and also a range of values. I paint watercolors and gouache pieces on location and they just don't come together until the darks go in. Thanks! I obsess about these matters in my artwork quite a bit! Currently, I consider value first. If there isn't enough contrast and value patterns in the final composition, the painting will not work, no matter your shapes or colors... value tends to dictate shape it seems... and, color for me is considered last, after I have the first 2 hammered out. Then I worry about my colors. I don't know if this is right or wrong, but it seems to be my method right now... I love your work, Diane... and I am painting a cat today, thinking of all of your beautiful cats! Thanks!